1. In 1980, the New York Times was worried about the popularity of pancakes. 2. Is it possible for a pancake to be ephemeral? I mean, this pancake has cornmeal in it, with crispy and buttery edges, but the inside – oh, the inside! – the inside is so light it’s almost ephemeral. Seriously. 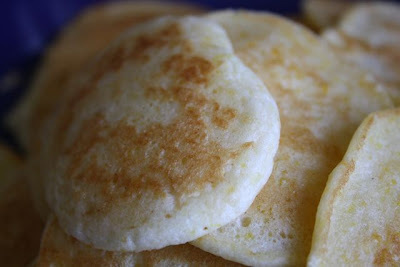 This pancake – which is properly called a hot cake – almost lifts itself off my plate, it is so heavenly. 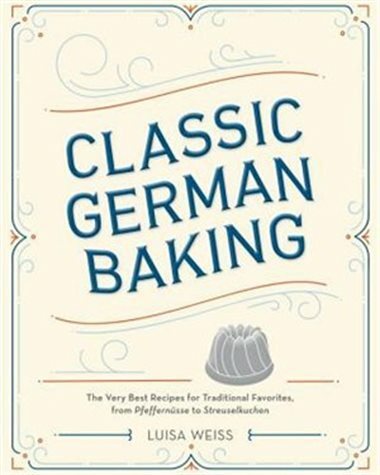 I thank Amanda Hesser of The Essential New York Times Cook Book: Classic Recipes for a New Century for bringing it to my attention. The recipe was first published in the New York Times in 1980, and it’s actually from food writer Craig Claiborne’s mother, Kathleen. Apparently, the recipe ran as part of a group of recipes cautiously heralding the return of the pancake. That was 31 years ago. Have we progressed since then? I personally believe in pancakes. 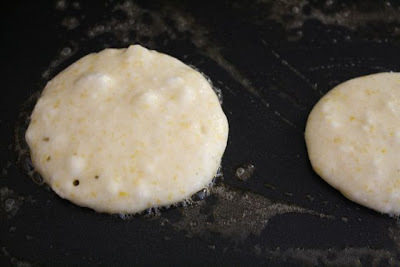 I grew up with both my dad and my granddad making hot cakes on the griddle on Saturday morning and Sunday lunch, so it is most likely in my genes. 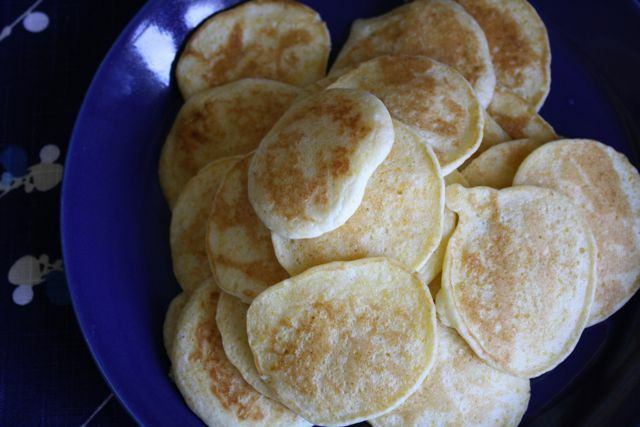 Scott and I now often eat pancakes for weekend breakfasts: banana-oatmeal pancakes, buttermilk-huckleberry pancakes, and now, these cornmeal hot cakes. Oh, I see we’ve somehow gotten back to Kathleen Claiborne’s hot cakes. May I suggest again that you make them as soon as possible? That they are so delicate that they are almost ephemeral on the inside? That they taste buttery and faintly like corn, and that is a very good thing? 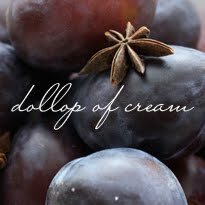 As Amanda Hesser points out in her book, this recipe does not get off to a promising start. First, you make a stiff little porridge of cornmeal and water. But you must not fear: when everything else is added, it does get smooth. Really, any recipe that calls for egg whites beat into stiff peaks must cook up light and airy in the end. I have always been fond of fruit and yogurt on my pancakes, but Scott has been pulling me toward the simple life: butter and maple syrup. 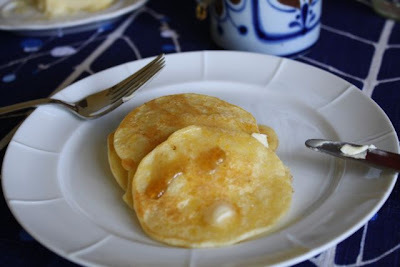 I find that works especially well here; the cornmeal makes the hot cakes almost savoury and that is a lovely match for the butter and syrup. Now, what about you? Are pancakes dead or alive in your part of the world? What is your favourite? 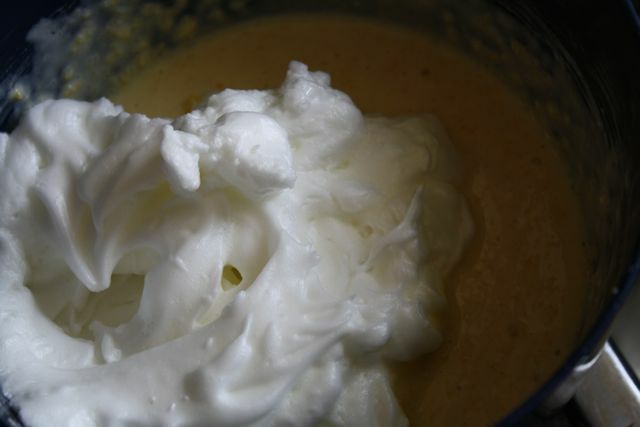 Beat the egg whites until they form stiff peaks. Set aside. In a small bowl, beat the egg yolks quickly with a fork to loosen them up. Set aside. Measure the flour(s) and baking powder and mix well. Set aside. 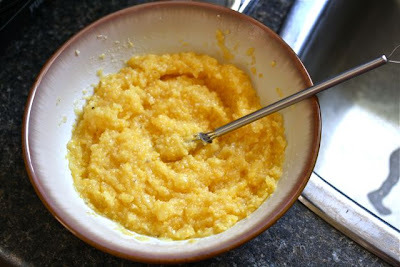 If the corn mush has cooled somewhat, whisk the yolks into it. Whisk in the flour-baking powder mixture and don’t worry about how thick it gets. Whisk in the yogurt-milk mixture and oil – see, all smooth now. Carefully, fold the egg whites in. Fry until you see bubbles popping and the edges setting slightly. Flip and fry until golden brown on the other side. Serve immediately or keep warm in the oven set to 175 degrees Fahrenheit. Every Saturday morning is Pancake Saturday at our house. We have our usual recipe but sometimes branch out into banana pancakes, apple oatmeal pancakes, or other "plain" recipes. We'll definitely have to give these a try - thanks for the recipe! Well, to start, I wouldn't recommend making these with a toddler underfoot, a husband leaving for work, a baby on your hip and a new dog barking outside. But, the husband went to work, the baby went to bed, and me and my girl sat down for some delicious hotcakes for a Wednesday morning breakfast. The ultimate challenge - will the spoiled girl who only eats Daddy's Skinny Pancakes actually eat them? Oh yes. She did. Butter and syrup yes. A little whip cream? Icing on the hotcake.